That's why the GetUp WILLPOWER legacy fund has been created. It's by and for GetUp members to advance Australia fair, not just into the next election – but the next decade and beyond. We know that political parties are losing their members and their currency. But an independent movement accountable only to its members – and powered by the heart, energy and generosity of everyday people – will be as relevant tomorrow as it is today. 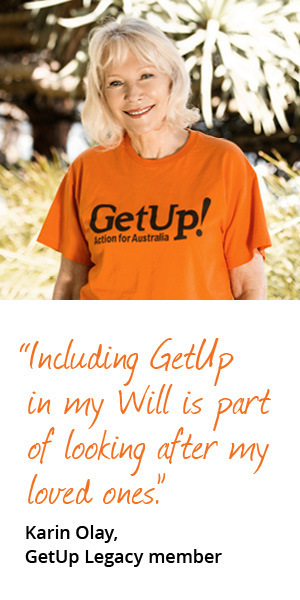 When you make a bequest to GetUp's WILLPOWER legacy fund, you join a group of our most committed and visionary members. People who believe not only in standing up for social justice, economic fairness and environmental sustainability throughout their life – but also in their life's legacy. As a way of saying thank you, GetUp staff will extend private invitations to GetUp Legacy Member events, and include you in exclusive communications and updates. As part of your welcome pack, the team will also send you a GetUp Legacy pin: a reminder of your contribution and our movement's lasting gratitude, which you can carry with you daily. If you feel strongly about justice, sustainability and fairness, this is your opportunity to take the work we've begun forward, and invest in a stronger democracy for future generations. Thank you for being part of this. Like all that we do, the power comes from you. How to leave a gift to GetUp? When making out your Will, your first priority is to ensure that it reflects how you choose to look after your family and friends. Once you have done that, including a bequest to GetUp is an easy process. Whatever the size, every bequest is important to us. You can either include the bequest when you write your will, or simply add one as a codicil to your existing will. In either case, you should seek professional advice from a legal adviser, to ensure your wishes are recorded in a legally binding way. We think the GetUp community are amazing, and if you're intending to make a gift in your will we'd like to know so we can keep you informed of special activities, invite you to events and say thank you every once in a while! If you prefer to remain anonymous, we will honour this also. What wording should I use when making a bequest to GetUp? "I give and bequeath to GetUp Ltd, a company limited by guarantee, the sum of $[insert amount] to be used for its general purposes after the payment of all my just debts, funeral and testamentary expenses and all duties, taxes and charges payable on my Estate at my death." "I give and bequeath to GetUp Ltd, a company limited by guarantee, [insert gift] free of all duties and taxes payable at my death, to be used for its general purposes after the payment of all my just debts, funeral and testamentary expenses and all duties, taxes and charges payable on my Estate at my death." "I give and bequeath to GetUp Ltd, a company limited by guarantee, the residue of my estate to be used for its general purposes after the payment of all my just debts, funeral and testamentary expenses and all duties, taxes and charges payable on my Estate at my death." "I give and bequeath to GetUp Ltd, a company limited by guarantee, [insert percent]% of my estate to be used for its general purposes after the payment of all my just debts, funeral and testamentary expenses and all duties, taxes and charges payable on my Estate at my death." Can I leave a bequest to a particular campaign? No. The text of wills is complicated business - often, words have a legal meaning that is different to their everyday meaning, and an improperly worded will might render it defunct. Rather than including the cause you'd like your contribution to support in the text of your Will, please notify Getup via the attached form or email, which campaign you would like us to attribute your gift too. I’ve already drawn up my will. Am I still able to leave a bequest for GetUp? Yes. You'll need to draft a codicil in order to do this. We've included a template for this, but you should seek the advice of your lawyer. Beneficiary: Any person or organisation to whom you wish to leave a legacy or bequest (gift) in your will. Bequest: A gift nominated in your will, also referred to as a Legacy. Various forms of bequest exist, e.g Residuary Bequest, Pecuniary Bequest, Specific Bequest. Codicil: Any change or update that you make to your will. It must follow the same legal formalities as the original will. Estate: The total sum of your possessions, property and money (minus debts) left after your death. Executor(s): Person(s) appointed by you to make sure the wishes in your will are carried out. Probate: The legal procedures after death which confirm your will is valid and confirm the executor's authority to carry out your wishes. Residuary Bequest: A gift of the remainder of the estate after all other bequests have been made and debts cleared. Specific Bequest: A particular named item left as a gift in your will, for example a piece of jewellery. Intestate: The condition of dying without having made a will. "GetUp and I go way back – to the early campaigns to save the ABC, the Great Barrier Reef and so many others. I'm a passionate environmentalist but what I love about GetUp is it gives me an opportunity to make a big difference on so many important issues. It's really an essential organisation, and very effective. They're punchy and creative. They know how to communicate an issue in a way that works, and holds politicians accountable.